354P/LINEAR (formerly P/2010 A2 (LINEAR)) is a small Solar System body that displayed characteristics of both an asteroid and a comet, and thus, was initially given a cometary designation. Because it has the orbit of a main-belt asteroid and showed the tail of a comet, it was listed as a main-belt comet. But within a month of discovery, an analysis of images by the Hubble telescope suggested that its tail was generated by dust and gravel resulting from a recent head-on collision between asteroids rather than from sublimation of cometary ice. This was the first time a small-body collision had been observed; since then, minor planet 596 Scheila has also been seen to undergo a collision, in late 2010. The position of the nucleus was remarkable for being offset from the axis of the tail and outside the dust halo, a situation never before seen in a comet. The tail is created by millimeter-sized particles being pushed back by solar radiation pressure. P/2010 A2 was discovered on January 6, 2010 by Lincoln Near-Earth Asteroid Research (LINEAR) using a 1-meter (36") reflecting telescope with a CCD camera. It was LINEAR's 193rd comet discovery. It has been observed over a 112-day arc of the 3.5 year orbit. It appears to have come to perihelion (closest approach to the Sun) around the start of December 2009, about a month before it was discovered. With an aphelion (furthest distance from the Sun) of only 2.6 AU, P/2010 A2 spends all of its time inside of the frostline at 2.7 AU. Beyond the frostline volatile ices are generally more common. Early observations did not detect water vapor or other gases. Within less than a month of its discovery it was doubtful that the tail of P/2010 A2 was generated via active outgassing from sublimation of ices hidden beneath the crust. Early modeling indicated that the asteroid became active in late March 2009, reached maximum activity in early June 2009, and eased activity in early December 2009. Observations with the Hubble space telescope and the narrow angle camera on board the Rosetta spacecraft indicate that the dust trail seen was probably created by the impact of a small meter size object on the larger asteroid in February or March 2009, although it cannot be ruled out that the asteroid's rotation increased from solar radiation resulting in a loss of mass that formed a comet-like tail. P/2010 A2 is likely about 150 meters (460 feet) in diameter. Even when it was discovered it was suspected of being less than 500 meters in diameter. Another object, centaur 60558 Echeclus in 2006, was suspected of outgassing as a result of an undetermined splitting event. The orbit of P/2010 A2 is consistent with membership in the Flora asteroid family, produced by collisional shattering more than 100 million years ago. The Flora family of asteroids may be the source of the Chicxulub (Cretaceous–Paleogene) impactor, the likely culprit in the extinction of the dinosaurs. ^ a b c d Marsden, Brian G. (2010-01-07). 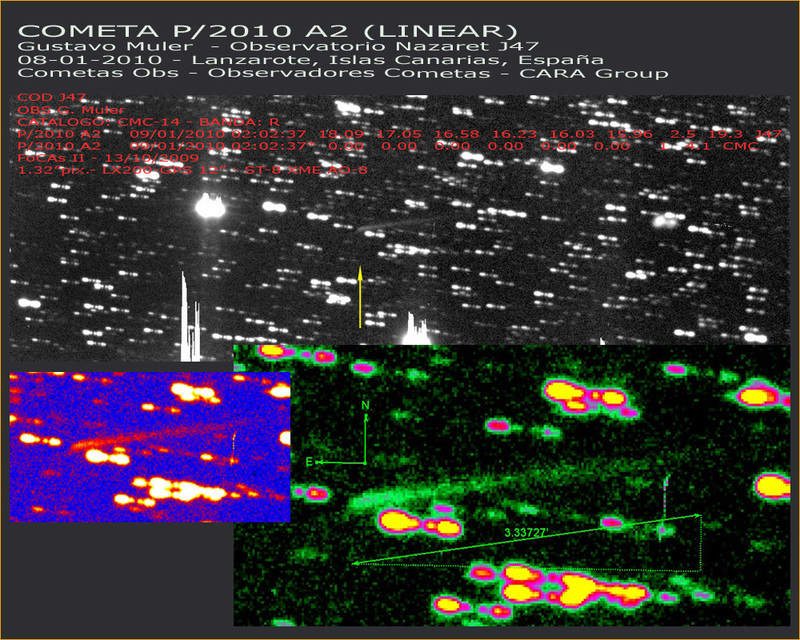 "MPEC 2010-A32 : COMET P/2010 A2 (LINEAR)". IAU Minor Planet Center. Harvard-Smithsonian Center for Astrophysics. Retrieved 2010-01-14. ^ a b c d e f "JPL Small-Body Database Browser: P/2010 A2 (LINEAR)" (last observation: 2012-10-14; arc: 2.83 years). Retrieved 2010-02-03. ^ "When is a comet not a comet? Rosetta finds out". ESA News. 13 October 2010. Retrieved 2010-10-15. ^ a b c Jewitt, David C. "P/2010 A2 (LINEAR): The 5th Main-Belt Comet". UCLA (Department of Earth and Space Sciences). Retrieved 2010-01-20. ^ a b Méndez, Javier (23 July 2010). "Comet P/2010 A2, an Activated Asteroid from the Main Asteroid Belt". Isaac Newton Group of Telescopes (ING). Retrieved 2010-07-27. ^ a b c d e f g Harrington, J. D.; Villard, Ray (2010-02-02). "Suspected Asteroid Collision Leaves Trailing Debris". NASA Release : 10-029. Retrieved 2010-02-03. ^ This absolute asteroidal V magnitude has been calculated using comet/asteroid magnitude analysis software "Comet for Windows" from value of R = 23.0 ± 0.5 taken from IAU Circular No. 9109. The mean V-R color index for asteroids is +0.4 ± 0.1. ^ Jewitt, David C. "P/2010 A2 (LINEAR): Possible Asteroid Smash". UCLA (Department of Earth and Space Sciences). Retrieved 2010-02-03. ^ "Glossary of Astronomical Terms (Ice line)". Glossary of Astronomical Terms. Archived from the original on 2010-02-14. Retrieved 2010-01-20. ^ Jewitt, David C.; Weaver, Harold; Agarwal, Jessica; Mutchler, Max; et al. (2010). "A recent disruption of the main-belt asteroid P/2010?A2". Nature. 467 (7317): 817–9. Bibcode:2010Natur.467..817J. doi:10.1038/nature09456. PMID 20944743. ^ Snodgrass, Colin; Tubiana, Cecilia; Vincent, Jean-Baptiste; Sierks, Holger; Hviid, Stubbe; Moissl, Richard; Boehnhardt, Hermann; Barbieri, Cesare; et al. (2010). "A collision in 2009 as the origin of the debris trail of asteroid P/2010?A2". Nature. 467 (7317): 814–6. arXiv:1010.2883. Bibcode:2010Natur.467..814S. doi:10.1038/nature09453. PMID 20944742. ^ Harrington, J. D.; Weaver, Donna; Jewitt, David C. (October 13, 2010). "Hubble Finds that a Bizarre X-Shaped Intruder Is Linked to an Unseen Asteroid Collision". Hubblesite newscenter STScI-2010-34. Retrieved 2010-10-15. ^ Shanklin, Jonathan (2010-01-18). "BAA Comet Section : Comets discovered in 2010". Institute of Astronomy (British Astronomical Association). Retrieved 2010-01-21. This page was last edited on 1 February 2019, at 21:11 (UTC).